The prime concern about rising energy consumption and increasing carbon footprint at a global scale has prompted governments to motivate users to opt for LED technology, observes Transparency Market Research. LED technology is currently being used in a wide range of applications within displays and lighting solutions. These factors are collectively creating a positive impact on the growth of the global LED driver and chipset market, as LED drivers are crucial components for improving the performance of LED lights. Tax exemptions offered by governments on LED devices have also prompted several consumers to replace traditional lighting solutions with modern LED technology. All of these factors put together are expected to create an opportunity worth US$11.99 bn in the global LED driver and chipset market by the end of 2021, rising from US$2.80 bn in 2014 at a CAGR of 23.2% between 2015 and 2021 in terms of revenue. The growing demand for prominent and large displays such as billboards and screens in sports stadiums, increased lifespan of LED lighting solutions, and reduced carbon footprint are some of the key factors augmenting the revenues of this market. However, the initial high cost of investment in LED drivers and chipsets is dissuading consumers. The lack of awareness about benefits of this technology as compared to conventional lighting solutions is also hampering the market growth. LED drivers and chipsets are used in lighting solutions and for in displays integrated in various electronic devices. The extensive demand for devices with displays is increasing the adoption of LED drivers and chipsets in the LED displays segment. Today, displays are in huge demand due to exponential consumption of mobile phones, television devices, sports arenas, medical devices, and billboards, amongst others. The displays segment is expected to expand at a whopping CAGR of 23.0% between 2015 and 2021 due to the aforementioned factors. Display makers are proactively opting for LEDs as they drastically reduce the maintenance costs and replacement costs, thereby allowing users to use the devices without any hassles or additional costs. The global LED driver and chipset market is spread over regions such as North America, Europe, Asia Pacific, and Rest of the World. Out of these, Asia Pacific held the largest share in the market, accounting for nearly 49.60% in 2014 in terms of revenue. This contribution is expected to climb up to 50% by the end of 2021. The sharp fall in LED prices due to growing investments by companies in expanding production facilities has resulted in the surge of the LED driver and chipset market in Asia Pacific. A strong presence of LED manufacturers in emerging economies of China, who are continuously improving conductivity, consumption, and voltage aspect of LEDs will propel the usage of LED drivers and chipsets over the forecast period. Some of the important players operating in the global LED driver and chipset market are Diodes Inc., Advanced Analogic Technologies Inc., and Ixys Corp. Continuous product innovation to differentiate from other products available in the market is one of the key strategies adopted by manufacturers. Furthermore, players are also focusing on developing LED products that are in tandem with technological developments and unique demands of the consumers to stay ahead of the competition. The global LED Driver and Chipset market is expected to experience stable growth throughout the forecast period from 2015 to 2021. LED Drivers and Chipsets are transformers that are either fitted inside or outside the LED devices and converts high voltage alternating current to lower voltage direct current for proper functioning of LEDs. 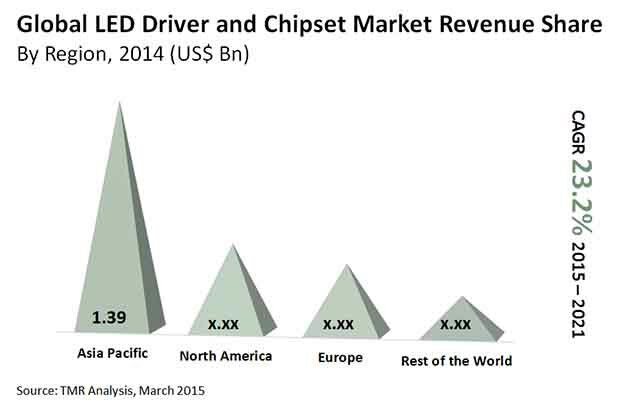 The global LED Driver and Chipset market is segmented on the basis of application and geography. By application, the LED Driver and Chipset market can be segmented into: display and lighting. By display, the LED Driver and Chipset market has been categorized into: mobile phones, digital camera, television and navigation devices, medical devices, computer/laptop peripherals and others. The others segment includes gaming devices, digital photo frames and MP3 players. The lighting segment is further segmented into: outdoor areas and traffic signals, automotives, indoor lighting and commercial lighting among others. In addition, a cross-sectional analysis has been provided with respect to all the above segments included in different geographical regions which include North America, Europe, Asia Pacific and Rest of the World (RoW). Increasing demand for lighting and display appliances having an extended lifespan and less power consumption are the major factors responsible for the enormous use of LED devices which in turn is responsible for robust growth of LED Driver and chipset market. The average lifespan of a LED is 50000 hours and utilizes a fraction of energy as used by traditional display and lighting devices whereas an incandescent bulb lasts for 1200 hours and a CFL lasts for 8000 hours. Moreover, LEDs use less power (watt) per unit of light generated (lumen). Thus, the extended lifespan and less power consumption have boosted the demand of LEDs which in turn is driving the global LED driver and chipset market. In addition, different initiatives such as Green Paper "Lighting the Future" (COM(2011)889) has been taken by the government across different parts of the world such as the US, the UK, Canada, Australia, brazil, New Zealand, China, India and Japan to reduce the consumption of power by phasing out the demand for incandescent and CFL bulbs in lieu of high quality power efficient LEDs. This automatically increases the deployment and usage of LED drivers and Chipset. However, lack of awareness about benefits associated with this new technology is restraining the growth of LEDs and restrains the users to switch from conventional display and lighting techniques to LEDs system. Moreover, even those who are aware of this new technology are changing their decision owing to high initial cost involved. In addition, proper functioning of LEDs largely depends on various conditions such as high temperature, incorrect polarity and inappropriate use of LED drivers and chipsets. This complex nature has discouraged consumers to switch to LED technology which in turn is restricting the growth of LED drivers and chipset market. In spite of these restraining factors, the LED Driver and Chipset market is expected to stand firm during the forecast period. The report also provides a conclusive analysis of the global LED Driver and Chipset market and the expected market growth for the period 2015 to 2021. In addition, in depth study of different market segments and detailed analysis of the LED Driver and chipset market across overall application segments has been provided in the report. Moreover, various macro and micro economic factors influencing the market growth of LED Drivers and Chipsets are also highlighted in this report. In 2014, among the different lighting applications, the outdoor lighting and traffic signal held the largest market share and is expected to witness a growth of double digit CAGR. However, the indoor lighting is expected to be the fastest growing market expanding at a CAGR of 26.0%. LED lights up very quickly and can reach full brightness in microseconds. Thus, it is most suitable for lighting purpose. Moreover, LEDs don't lose its brightness over time. Even if the LEDs dim over time, they never fail completely like HID sources. LEDs are needed to be replaced after they reach 30% lumen depreciation. These factors are responsible for wide use of LEDs for lighting purposes, which in turn affect the LED Driver and Chipset market positively. Bye different display segment, the medical devices held the largest market share in 2014. This segment's dominance is attributed to the increasing usage of LEDs used for lighting and display of devices used for teeth whitening, removal of wrinkle skin, endoscopy, stroboscopic and Computerized Tomography (CT scan)scan among others. In 2014, by geography, Asia pacific held the largest market share and is also expected to be the fastest growing market. Rising environmental concerns among the consumers regarding energy conservation coupled with increasing disposable income has fuelled the demand of power efficient LEDs used for lighting and display purposes. Moreover, initiative of government to promote LED lighting products has also boosted the demand of LED lighting. Owing to these factors, the LED Driver and Chipset market is expected to show an exponential growth during the forecast period. Overall detailed analysis of the global LED Driver and Chipset market and the expected growth for the period 2015 to 2021, after considering various macro and micro economic factors influencing the demand is provided in this report.